can be part of a nice circuit. Slievemaan is doubly disadvantaged. 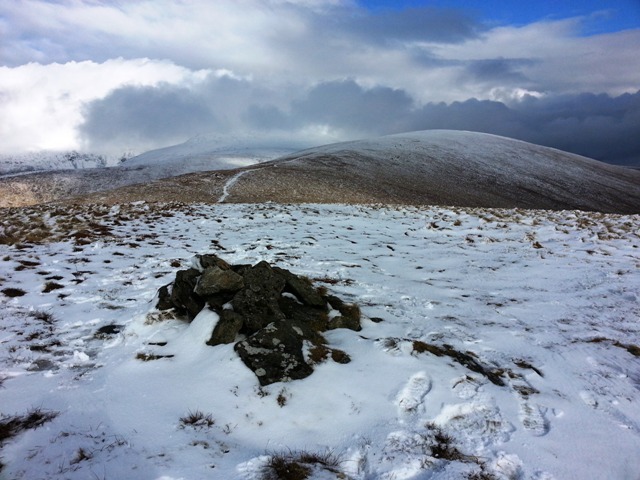 Firstly it is overshadowed (literally) by the highest summit in Leinster, Lugnaquillia, which gains the majority of attention from hillwalkers to these parts. Secondly Slievemaan is just not that exciting a summit. It is boggy, has no dramatic geology and is really just a stop on the way elsewhere. On the redeeming side, it is the 70th highest summit in Ireland, has fine views of nearby Lugnaquillia and it forms part of a fine circuit taking in Lugnaquillia, Slievemaan and Ballineddin Mountains. One option is to complete a circuit of the Slaney River valley. Start S97310 93557 A (Fentons Pub) and head along the road to join a trail at S98438 92935 B. From here follow the trail over Camarahill towards the summit of Lugnaquillia. At S01962 915 C 60 either contour around south to the col between Lugnaquillia and Slievemaan at T02217 91190 D, or continue up to Lugnaquillia and then come back down to the col. It’s an easy pull up to Slievemaan, although the col will be terribly wet and boggy on all but the most frozen of days. Enjoy the views from Slievemaan and its tiny cairn at T01756 90820 E. A trail will bring you on over the bog down and up to Ballineddin Mountain. You can pick your way down to the road at S98570 91435 F. From here follow the road/tracks back to Fentons Pub.